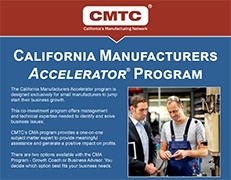 California Manufacturers Accelerator® (CMA) is a program designed for small and medium sized manufacturers providing a fresh review of your business, bringing technical expertise and leadership to identify and solve problems. Each year our advisors assist hundreds of manufacturers in identifying and implementing solutions to remove barriers to growth. Tools and resources to improve productivity and profitability. A CMA Advisor acting as a Business Advisor, may work in concert with a Growth Coach, providing one-on-one coaching to help you achieve your business goals. Helpful referrals to other business assistance resources. Networking opportunities with local manufacturers as potential customers, suppliers, and strategic partners. Information to leverage incentives and funding, when these special programs are available to offset costs for improvement or employee training. CMA is a guided, self-implementation program facilitated by your CMA Advisor and Growth Coach. The intention is to provide meaningful assistance and to generate a positive financial impact to your business. The more effort you put into it the greater the results! In a small manufacturing environment, it is the people who make the difference. Our group includes a wide range of expertise and knowledge to serve the unique needs facing smaller manufacturers in today’s global economy. Our advisors are interested in your company and helping you to succeed whatever your needs may be. Yes, I want a 30 min CMA Assessment for my business!